Star junior J.D. Antaya hopes to lead Blackstone Valley Tech to a Super Bowl victory over St. Mary's. As is often the case in high school sports, the MIAA Football season has been defined this fall by terrific senior performances. Largely behind leadership from senior quarterbacks, running backs, or middle linebackers, 16 teams are headed to Gillette Stadium next weekend to compete for a Super Bowl championship. Complementing those seniors, however, are a bevy of a talented underclassmen who have either built off strong freshman or sophomore campaigns or had a breakout season altogether. While the seniors may be the leading the way, the fellow sophomores and juniors are providing invaluable play making ability that helps push their teams over the top. 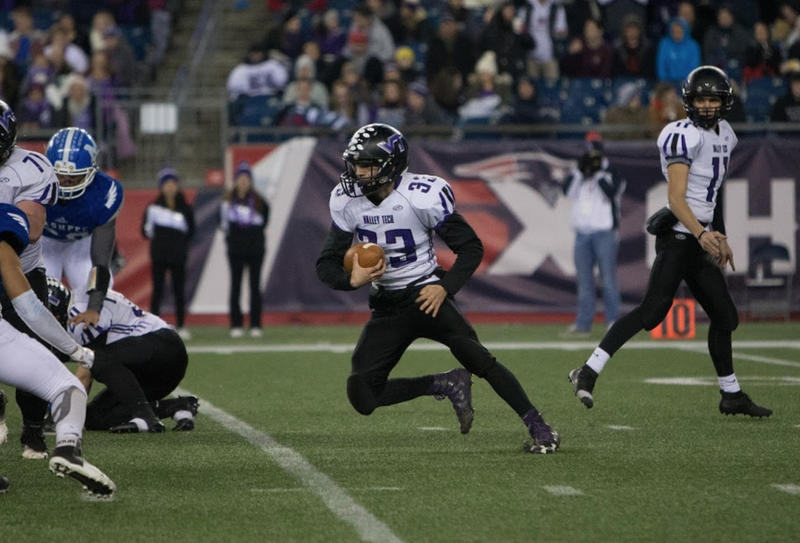 As we begin our Super Bowl coverage, we thought we would take a look at the top sophomores and juniors to watch over the course of the eight state title games at Gillette Stadium. Crowley got his feet wet after taking over the Eagles starting job midseason in 2017, and has used that initial experience to have a standout junior season. As the season has gone on Crowley has only improved. He methodically takes apart defenses with an ability to both get rid of the ball quickly and accurately throw deep balls down the sideline. On top of his strong arm, Crowley also moves well outside the pocket possessing the talents to throw on the run and scramble when necessary. Through three postseason games, Crowley has 10 touchdowns to just one interception. In the Eagles Div. 1 North Sectional Final win over Central Catholic, Crowley broke the single-season record for passing yards in St. John's Prep program history with over 1,100. Since early on in his freshman year, McGowan has had a bevy of hype surrounding him. McGowan has lived up to the expectations as he follows in his older brother Jack's footsteps. In helping Catholic Memorial reach the Division 1 Super Bowl, McGowan has been a key facet on both sides of the ball. While he may not jump off the stat sheet, the six-foot-one, 215 pound sophomore consistently makes key plays at both outside linebacker and fullback. That has never been more evident than during the Knights postseason run. Against Needham in the Div. 1 South Sectional Semifinals, McGowan had a 19-yard touchdown run. Then, in the Division 1 South Sectional Final, McGowan came through with a key forced fumble early in the third quarter versus Xaverian. McGowan has also proven to be a weapon on special teams where in each of the Knights previous two games he has been used to convert two-point rushes on fake PAT attempts. Most of the talk surrounding North Andover has revolved around either senior quarterback Jake McElroy or premiere athletes Gabe DeSouza and Darren Watson. Gabin, however, has played a major role in the Scarlet Knights reaching the Division 2 Super Bowl. After filling in due to injury early in the season, Gabin has never loosened his grip on the position. The junior back has turned into highlight reel performances on a number of occasions this season including a 160 yard, two touchdown night versus Division 3 Super Bowl participant Tewksbury. In the Scarlet Knights dominating effort versus Lincoln-Sudbury to win the Div. 2 North title, Gabin amassed three scores on the ground. Halliday has been the focal point of King Philip's ground and pound offense that has guided the Warriors to a third consecutive Super Bowl berth. One of the more unique aspects of Halliday's game is that while he may not be the quickest back in Massachusetts, his build, durability, and physicality allow him to wear defenders down as the game progresses. On the opposite side of the ball, Halliday has also developed into a reliable outside linebacker. A key in the Warriors top tier defense, the junior has come through with numerous key TFLs. For the season, Halliday has 14 rushing touchdowns and seven games with at least 30 carries. Kyles is the fulcrum of a Central offense that is littered with speed, athleticism, and big play making ability. As soon as Kyles has the ball in his hands, he is a threat to score using his explosiveness to elude defensive fronts and enact breakaway speed. The competition has been no match for the junior back up to this point. Kyles has 1,054 rushing yards and 19 touchdowns while averaging 9.4 yards per carry. Kyles has scored multiple touchdowns in three of Central's last four games. Perhaps most impressive about Kyles' numbers are that due to Central's dominance over its last 10 games, he has rarely been on the field in the fourth quarter. Alongside quarterback Aidan Sullivan, Sheskey has helped transform the Scituate offense into a pick-your-poison attack that is nearly impossible to stop. Sheskey's quickness and athleticism makes him a dangerous weapon both out of the backfield and in the passing game. Once through the defensive front, Sheskey possesses the capability to leave opposing secondaries in the dust with his breakaway speed. The junior has also emerged as a valuable member of the Sailors defense playing crucial snaps at defensive end. On the season, Sheskey has 216 carries for 1,560 yards, and 22 touchdowns on the ground to go with 21 receptions, 267 yards, and three touchdowns through the air. Broni has been the catalyst for the Nipmuc offense throughout its postseason run. Most recently, the junior back rushed for a pair of scores versus East Longmeadow in the Div. 5 State Semifinals to lead Nipmuc to its first Super Bowl appearance. Heading into the Super Bowl, Broni has 712 rushing yards and six touchdowns to go with 158 yards and a score in the passing game. Broni has also made key plays while at corner back. In the Div. 5 Central Sectional Final, Broni had a key interception to help propel the Warriors to a 14-6 win over Northbridge. Stoneham is known for its wing-T attack that relies heavily on an explosive running game. At the center of that attack is Russell who has had a monster junior season to complement senior Christos Argryropoulos. As the postseason has gone on Russell has only become even more explosive helping the Spartans leave the competition in the dust. In its Div. 6 North Sectional Semifinal win over Bishop Fenwick, Russell finished with 136 yards and four total touchdowns. Then, two weeks later in the Div. 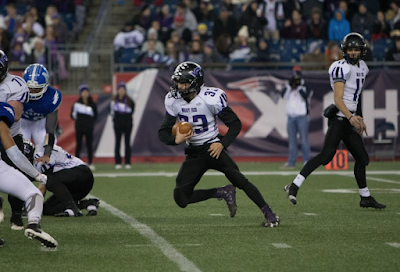 6 State Semifinals, Russell had 127 rushing yards, 47 receiving yards, and two total touchdowns as Stoneham cruised past Littleton to reach the Super Bowl. Russell's value, however, does not end there. As good as Stoneham's offense has been, so too has been its defense. A key component of that is Russell who has played well in the secondary all season long. To go with his big offensive output in that aforementioned state semifinal win, Russell also had a pair of interceptions. Brezinski was out for almost the entire regular season due to injury, but since his return his impact as a member of Old Rochester's stout defense has been immeasurable. In his first game back on October 19th versus Case, Brezinski had an interception that helped set up a scoring drive as Old Rochester claimed the South Coast Conference championship. Over the course of the postseason, Brezinski has maintained his high level of play using his ability to drop back into coverage and rush the passer to tournament opposing quarterbacks. The Bulldogs leading tackler from a season ago, the six-foot-one, 220 pound Brezinski has been the leader for a defense that has surrendered just 34 points over its last three games. Blackstone Valley Tech will be making its second consecutive Super Bowl appearance and it largely has to do with the play of Antaya. The Beavers junior back has been one of the most explosive players in Division 7 throughout the season, excelling on both sides of the ball. In the Div. 7 Central Final versus Leicester, Antaya rushed for 101 yards and three touchdowns. Antaya, however, proved to be much more than a high-profile running back in that sectional final showdown with the junior also coming through with a 55-yard interception return for a touchdown. Heading into the Division 7 Super Bowl versus St. Mary's, Antaya has 878 rushing yards and 13 touchdowns. If you can't include Shane Aylward of tewksbury on this list. you have zero credibility. Look up his numbers and his contributions to an 11-1 team heading to the D3 SB. Blew this one big time.